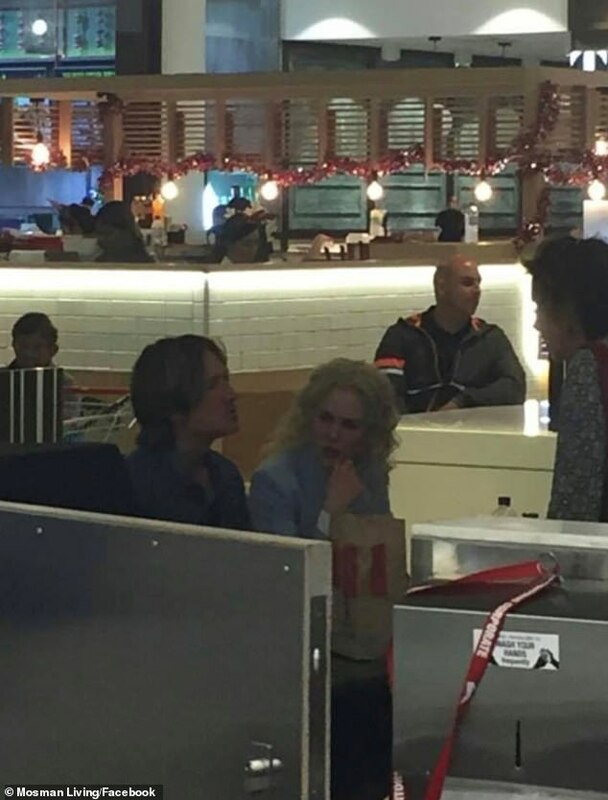 Nicole Kidman and Keith Urban had a finger lickin’ good time at the Chatswood Chase mall in Sydney’s Lower North Shore on Thursday. The Hollywood power couple were spotted having dinner at a KFC restaurant during a late-night shopping spree, which included a VIP trip to Kmart. In a photo shared to Facebook, the actress, 51, kept a low profile in a blue shirt while sitting in a booth with her country music star husband. A brown paper bag sat on the table in front of them, however it is unclear what meal they ordered. Daily Mail Australia has contacted KFC for comment. The couple reportedly visited several shops, including Kmart and Australian retailer Country Road, during their visit to Chatswood Chase. According a comment left on the Mosman Living Facebook page, Nicole and Keith did not have to line up at Kmart – perhaps due to their celebrity status. ‘They did a big shop in Kmart. The staff were beside themselves taking photos! They didn’t have to line up, they got a special cashier,’ wrote a fellow shopper. Nicole and Keith, also 51, recently appeared at the ARIAs, an awards ceremony for the Australian music industry comparable to the Grammys or BRITs. Keith hosted the prestigious event, at one stage embarrassing his wife by describing her as an ‘up and coming actress’. ‘I think good things are ahead for her!’ he added. The Oscar winner was seen covering her face in the audience, but appeared to take her husband’s joke in good humour. The ARIAs was also something of a family reunion for Nicole, who grew up in Sydney, who posed with her niece Lucia Hawley, 19, on the red carpet.